From the world renowned maker of PowerBlocks comes the KettleBlock. The KettleBlock 40 replaces 8 Urethane kettlebells in 1/8th the space replacing 186 lbs of kettlebells at a fraction of the cost. You could expect to pay about double that for traditional kettlebells and have 8 kettlebells to store instead of 1 KettleBlock. 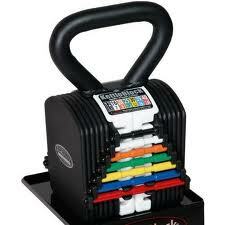 The KettleBlock 40 gives you kettlebells in increments of: 8, 12, 16, 20, 25, 30, 35, 40 pounds.